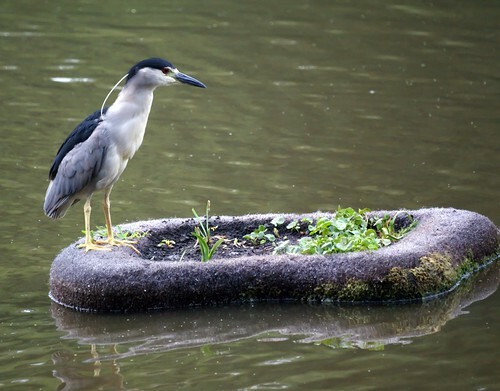 Frequent readers of this blog will know that we put an anchored floating island out on the lake, put some plants on it, and hoped to have a little Galapagos Island off our dock. We've had a sandpiper or two, several turtles and eleven baby ducks who ate the expensive plants. Tonight, we were pleased that a night heron made a bouncy landing and fished for a while. We're also glad to see some plants growing back.